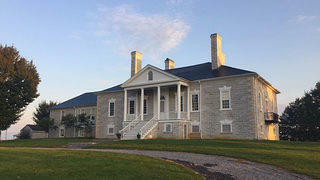 Belle Grove was built in 1797 near Middletown, Virginia, in the Shenandoah Valley. Ever since I first heard about Joseph McGill and the Slave Dwelling Project, I knew I wanted to participate. After missing out on a couple of Joe’s visits in D.C. and Maryland (one of which my colleague Sarah Heffern attended at the Octagon House), the perfect opportunity arose when the staff at Belle Grove Plantation, a National Trust Historic Site, let us know that Joe was coming to stay. Not entirely knowing what to expect, but with a lot of enthusiasm, I packed up the most comfortable sleeping accoutrements I could find and made the 90-minute drive from D.C. out to the Shenandoah Valley on a crisp October day. A few unique circumstances made this visit a little different than Joe’s usual stays. For one thing, the Slave Dwelling Project event coincided with the annual re-enactment of the 1864 Battle of Cedar Creek, meaning that the nearby town of Middletown was saturated with “Union” and “Confederate” troops and spectators. 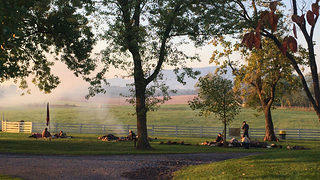 We learned that some “Confederates” would even be camping out on the front lawn at Belle Grove during our stay there. Furthermore, a group of college students from Bloomsburg University in central Pennsylvania were traveling down with their professor to join Joe and several of his board members (Terry, Prinny, and Lynda), in addition to myself and Belle Grove Executive Director Kristen Laise, to stay over at Belle Grove. After lunch and introductions at Middletown’s historic Wayside Inn, we took a tour of the Cedar Creek battlefield with our terrific guide, National Park Ranger Shannon Moeck. As the day went on and we learned more about the history of Cedar Creek and Belle Grove, our conversations grew deeper. One of our most meaningful discussions began after we heard the story of Judah, an enslaved cook who lived at Belle Grove during the early 19th century. We learned that Judah only lived to be about forty years old; she had at least ten children during her lifetime (per the documentation available from Belle Grove), at least several of whom were sold or given away to other slave owners. As a cook, Judah worked long, laborious hours in the hot, smoky kitchen underneath Belle Grove’s main house. She may have even slept on the same floor we would be staying on that evening. Hearing Judah’s story was powerful and transformative, and it served the entry point for us to talk about many complex issues, including slavery, women’s rights, and racism, in both a modern and historical context. By the end of the day of talking and touring, our diverse group of near-strangers had built up a foundation of trust with one another. 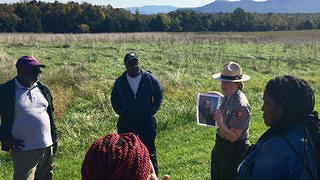 National Park Ranger Shannon Moeck teaches the group the history of Belle Grove. 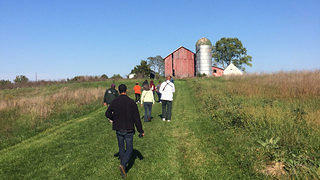 Moeck leads the group around the property. Belle Grove served as Union headquarters during the Battle of Cedar Creek in 1864. 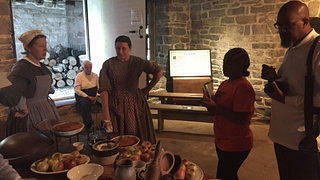 Participants learn about the kitchen at Belle Grove and how it would have operated when Judah worked there. I work up quite early the next morning with a sore neck and back (no matter how much padding you bring, a brick floor is still a brick floor) and my mind still turbulent, trying to process everything we had learned and talked about the day before. Our last activity together was an exercise where we shared our thoughts on the weekend and what we would take away from our experience. The conversation was genuine, emotional, and inspiring. I have attended many historical tours, events, and seminars in both my personal and professional life, and this experience was easily one of the most powerful. I was reminded, yet again, of the special power of historic places like Belle Grove that lets us connect with another and confront the past together. Visit the Slave Dwelling Project website to read reactions from Joe, Prinny, and Lynda about their Belle Grove experience.